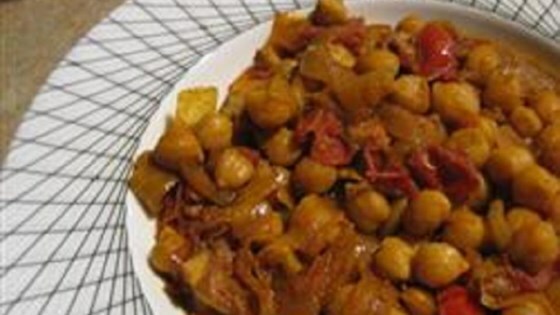 "A delicious dish of chickpeas, onions, and tomatoes! You will love this stuff! I suggest eating this with fresh fried naan." Heat oil in a large saucepan over medium heat. Saute onion, garlic, ginger, and green chile pepper in hot oil until onions are translucent, about 10 minutes. Season onion mixture with cumin, paprika, coriander, garam masala, turmeric, and cayenne pepper; stir. Cook onion with spices until fragrant, 1 to 2 minutes. Add tomatoes, chickpeas, and tomato sauce; stir and simmer until the tomatoes soften, about 5 minutes. Stir yogurt into the mixture until the color of the mixture is even; simmer until again hot, about 5 minutes more. Remove pan from heat; stir lemon juice and salt into the mixture. You may want to add more than one green chile pepper if you like to have things very spicy. I generally use 2 jalapenos for this recipe. This was ok, but probably won’t try it again. I tried it for breakfast one day and I loved it, Great taste as it is. Very good dish, a little on the bland side for me. My husband was a huge fan. Love this. So delicious, a terrific balance of flavors... Just A+ all the way around. Even my husband, who doesn't particularly like chickpeas, liked this. Surprised the tomato sauce worked, but it did! This had a decent taste spice wise (not very hot) but was too strong of a tomato flavor for us. Also didn't love the consistency/texture - not sure exactly why. Delicious! Followed the recipe and very happy with the results! Spicy and well balanced flavours. Can’t wait to enjoy the leftovers!